Renault appears to be happy on their home market, where rumours of a new and bigger Zoe are getting louder. The 2019 Zoe could see the spotlight at this year’s Auto Salon in Paris already and speculations speak of new cells from CATL and charging with CCS. Renault has not offered any details but a new Zoe is a certainty. Different from the latest mass of (German) carmakers rushing to grow in China, Renault would make their electric vehicle at their Douai factory reportedly. The makeover of the continuous bestseller in France is likely to retain the size of battery (41 kWh) in order to keep the price low. The same goes for the electric drive system. The cells however may come from CATL rather than LG Chem. 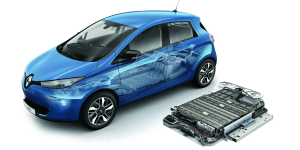 This move is particularly likely after Renault confirmed they were to use cells from CATL for the incoming electric version of the Kangoo (we reported). The Zoe may gain in size though and it is as good as certain that the new fast-charging standard is to be CCS. Renault will be retooling their factory in France this August, also to supply the lasting demand for the Zoe electric car.